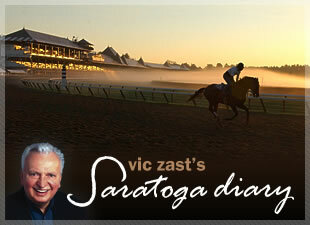 It’s been a long time since a day of Saratoga horse racing other than Travers Day caused as much anticipation as Saturday’s. Too bad that after a long string of sunny, dry days, a little rain fell. Nevertheless, it was an afternoon of roundly felt satisfaction – the best card of the year, three races for two-year-olds of substantial promise and a guaranteed $500,000 Pick Four that included three stakes races. The biggest stakes was the gr. 1 $750,000 Whitney Invitational Handicap. Tizway, trained by everyone’s favorite backstretch regular, James Bond, was the winner. The dark bay four-year-old colt by two-time Breeders’ Cup Classic winner Tiznow became the first horse to win the Whitney and Metropolitan Handicaps in the same year since 1991, when In Excess won them both. He triumphed with such dominance that the fans were left breathless and he clearly established that he was the country’s best horse. Caption: Tizway connections after the Whitney Handicap. When Tizway returned to the winner’s circle he found hundreds of people to greet him. 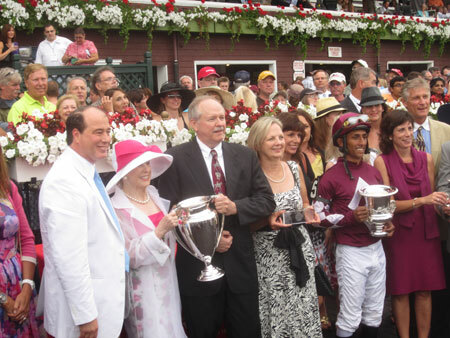 Dan Silver, NYRA’s Director of Communications, tried his darnedest to keep the press from swarming the trainer, jockey Rajiv Maragh and Marylou Whitney, who presented the connections with trophies. There was one dicey moment when someone who didn’t belong interrupted John Hendrickson and tried to pose with his wife for a photo. But New York State’s finest stopped the jerk in his tracks, allowing Whitney and Hendrickson to exit by golf cart unimpeded. Turbulent Descent won the $250,000 gr. 1Test Stakes. Her victory, too, was a tour de force – a three and three-quarters length score that required not one touch of the whip to her hide from her rider. As soon as it became evident that the California invader American Lady had not developed the class to face fillies as gritty as the field’s, jockey David Flores swung his mount wide for the homestretch and took off like a rocket. Darley Stable’s Higher Court won as he pleased in a 5-1/2 furlong grass race. Two noteworthy longshots that shook up the crowd were Trix in the City and Optimizer. The 27-1 Optimizer’s upset of nine other two-year-old maiden colts and geldings in the second race came first. D. Wayne Lukas cinched the saddle on him. Later on the card, Trix in the City racked up a $50.50 payoff in winning the $75,000 De La Rose Stakes for Rick Violette. George Schillinger, the veteran white cap who mans Section B in the clubhouse, played the spoons for the band in the backyard on one of his breaks. It was the seventh straight year that he’s done it. Outside the jockey silks room, the Belmont Child Care Association provided cute Christmas ornaments of four horses with their legs dangling in the starting gate to everyone making a $10 donation.